As a cultural business in the heart of Doncaster, we enjoy being a part of a thriving borough that has so much to offer. We love to work with other businesses and find ways to support each other. 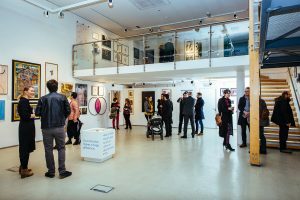 If you are interested in sponsoring an element of our programme, one of our exhibitions in the gallery, or one of our artists, do talk to us! We have lots to offer and have a strong reputation for partnership working. We are thrilled to work with Keepmoat Homes and the Screwfix Foundation – both of whom have recently provided vital funding for areas of our work that it’s hard to fundraise for. Keepmoat Homes helped us to build the new temporary exhibition space for the Bill Viola exhibition as part of Tate and National Gallery of Scotland’s ARTIST ROOMS initiative. Screwfix has provided much needed funds towards repairing and re-painting the front of The Point as it is currently looking a little run down. We are looking for an additional £5000 to match the Screwfix donation to complete this refresh in 2019 and ensure that The Point is an attractive and special venue for Doncaster residents and tourists to visit. If you would like to make a donation and help us reach our target to Paint The Point then do get in touch! For more information, please contact Sophy Sylvester, Head of Fundraising and Development on 01302 558059 or sophy@thepoint.org.uk.